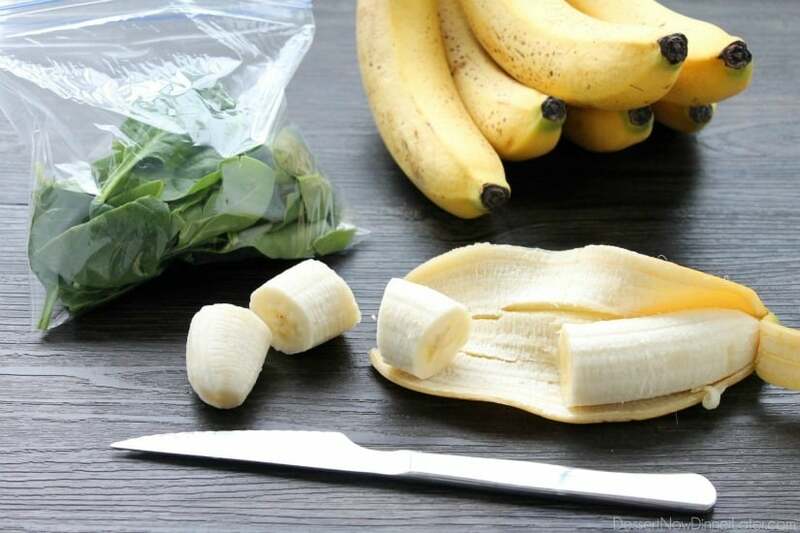 Freezer Smoothie Packs (+ Video) - Dessert Now, Dinner Later! One of my absolute favorite things for breakfast is a smoothie and peanut butter toast. I love that I can put whatever I want in my smoothies and they almost always turn out delicious. I also love that my kids have started drinking green smoothies because we all know how picky little kids are, and I need to squeeze veggies in any way that I can. They actually beg me to make these green smoothies for them! That’s a mom win right there. 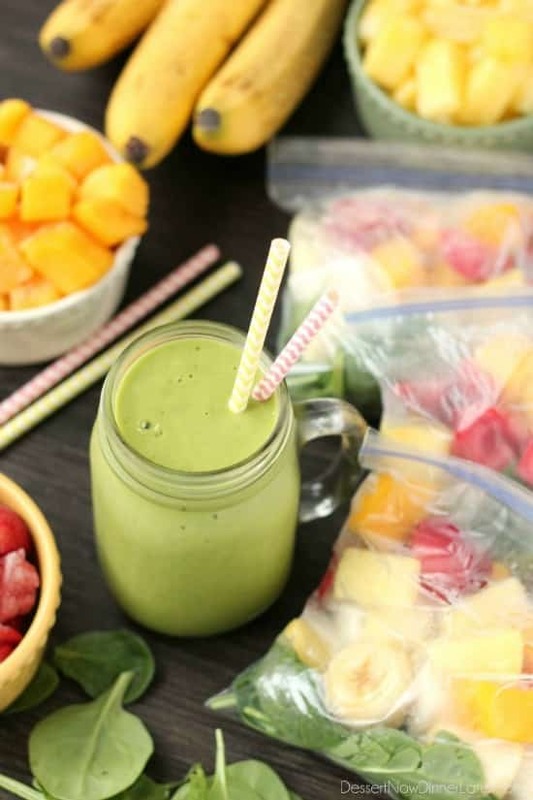 This is a basic green smoothie pack. It has fruit, yogurt, and spinach. You can always add more greens and less fruit the more accustomed you grow to “health food.” It’s an adjustment for your tastebuds if you aren’t used to drinking green smoothies, so start with these. Try heartier greens like kale, or throw in some chia seeds or peanut butter powder for more protein. These are totally customizable, but this is how I do it. 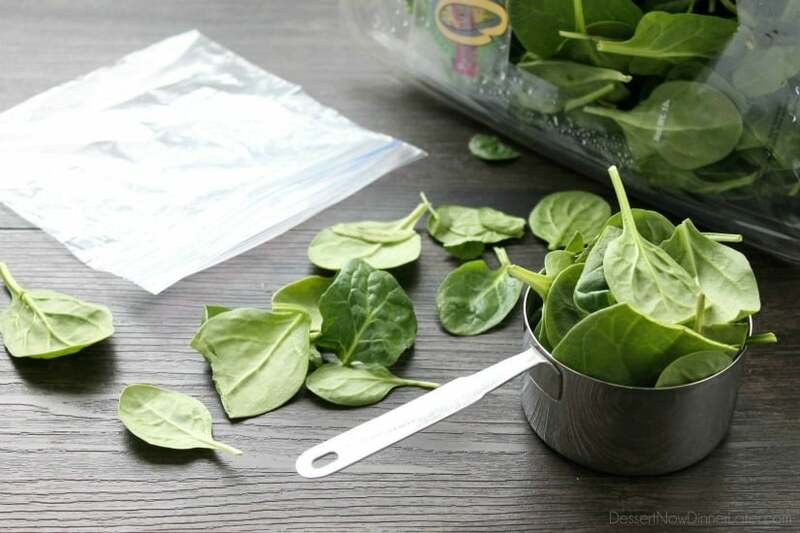 Start with 1 cup of packed spinach. 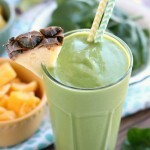 I actually like extra spinach in mine, but for the purpose of today’s post, do 1 cup. You really don’t even taste it with the sweetness of the fruit in there. Add half of a banana. I cut mine up into smaller pieces so they blend easier. If you are making these dairy-free, put in a whole banana instead of half. It’s like the banana ice cream, most of us have probably tried. It makes it creamy, but with fruit instead of dairy. Add 2 cubes of frozen, plain Greek yogurt. 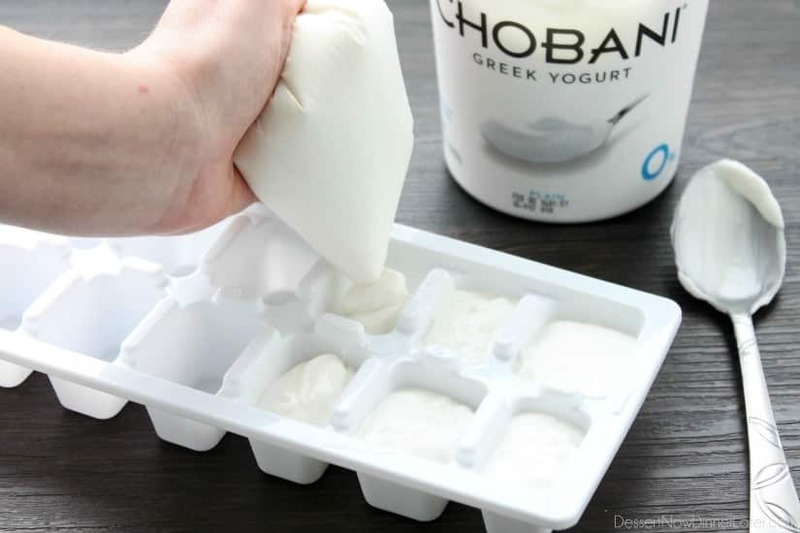 This part needs to be prepped ahead of time, but freeze the yogurt into an ice cube tray. I do this by putting the yogurt in a zip-top bag, then I cut off the corner and squeeze it into each cup. Tap the ice cube tray to remove any air bubbles. If you try putting the yogurt into the cups with a spoon, it gets kind of messy, hence the baggie. The Greek yogurt has more protein than regular yogurt, so it will help keep you full longer. Add 1 cup of assorted fruit. 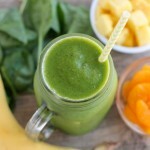 Green smoothies do better with yellow or orange fruits (bananas, pineapple, mangoes, peaches, etc.) You are welcome to do berries, but they may change the color to an unappetizing brown. It will still taste good though. I do mostly light colored fruits and a little bit of strawberries or raspberries. Blueberries and blackberries tend to make the smoothies brown. 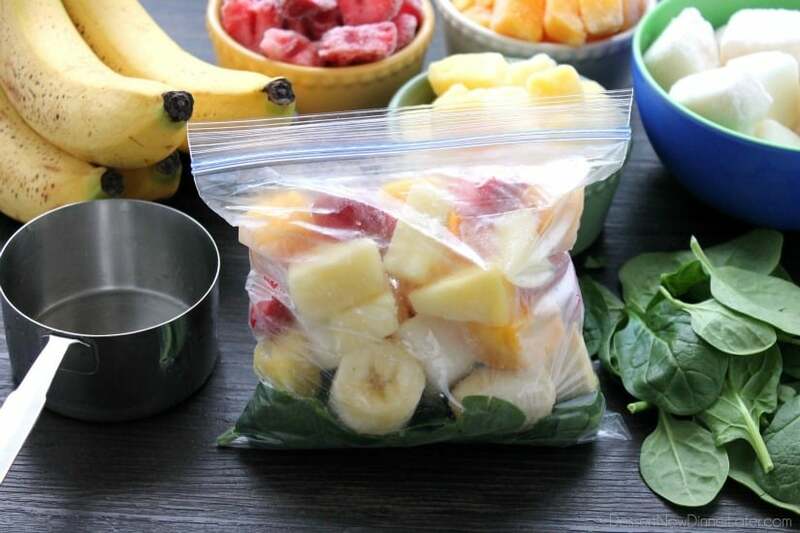 Zip up the bag, put it in the freezer, and repeat to prepare as many smoothies as you need! Voila! Done! When you’re ready to eat, just pour 1 cup of milk (cow, almond, coconut, etc) or water in a blender and add the frozen smoothie pack. Blend until smooth adding extra liquid if needed. The amount of liquid will heavily depend on the quality of your blender and how cold your freezer is. My Blendtec doesn’t need a ton of liquid. 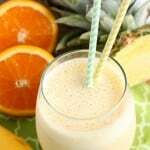 This recipe makes a large, 2-cup smoothie. I hope you love these smoothie packs! Do you have any meals that you like to prep ahead for? What are they? I’d love to hear your ideas in the comments! Originally published on Super Healthy Kids on 02/09/16. To prepare: Pour 1 to 1 & ¼ cup water or milk in a blender. Add one frozen smoothie pack and blend until smooth, adding extra water or milk if desired to preferred consistency. If you want a more filling smoothie, you can swap the Greek yogurt with a scoop of protein powder. This is my favorite on Amazon: http://amzn.to/2pV6chA (affiliate link). You wouldn't freeze it with the fruit though. When you go to make the smoothie pour the milk in your blender, then the scoop of protein powder, then the frozen smoothie pack so everything blends better. You can also add 2 Tablespoons of flaxseed meal or 1 Tbsp chia seeds for extra health benefits (Omega-3 fatty acids) when you add the protein powder. 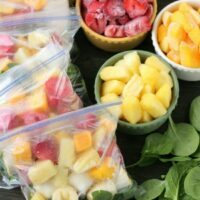 Love the idea of having smoothie packs ready to go for whenever I want one! I need to do this soon! They are super convenient, that’s for sure! Thanks Jess! 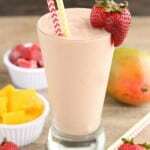 Hi Jessie, To prepare the smoothie: Pour 1 to 1 & ¼ cup water or milk in a blender. Add one frozen smoothie pack and blend until smooth, adding extra water or milk if desired to preferred consistency. Enjoy! Sometimes when I make smoothies the kids don’t like them because they are not sweet enough. Do you add any sweetener? Hi Brynn! I don’t usually add sweetener unless the fruit is especially tart. You can definitely add honey or sugar when you blend them, or you can try doing fruit juice instead of water or milk if that will help your kids drink them better. What a great idea!! Thank you!! Glad I could inspire you Diana! I’m a newbie to the freezer smoothie pack game and was googling some ideas when your site popped up!! I love the idea of making the yogurt cubes. I always buy the big containers and it goes bad before I get through the entire thing. Genius. That’s awesome! Yes, freeze your yogurt! Don’t let it go to waste. Thanks Jesseca! I know you recommend freezing the yogurt…but does the smoothie work out if you don’t freeze the yogurt? Absolutely! You can add the yogurt when you add your liquid. Enjoy! I would say up to 2 months, maybe 3. I used mine all up before that though. Can I substitute coconut yogurt or almond yogurt? I wasn’t sure on if this froze well or not. I’m assuming it fine but wanted to know if you had tried this. I can’t wait to try this! I haven’t tried freezing those yogurts yet. You can test freeze a few, but if you are nervous, you can always freeze everything but the yogurt and add it with your liquid when you blend the smoothie up. Good luck and enjoy! Would you add protein powder if you used Greek yogurt? You can (it would make a lot of smoothie though), or you can swap the Greek yogurt for protein powder. I would just add it as you are blending though. I’m not sure how it would do in a baggie with fruit and spinach. 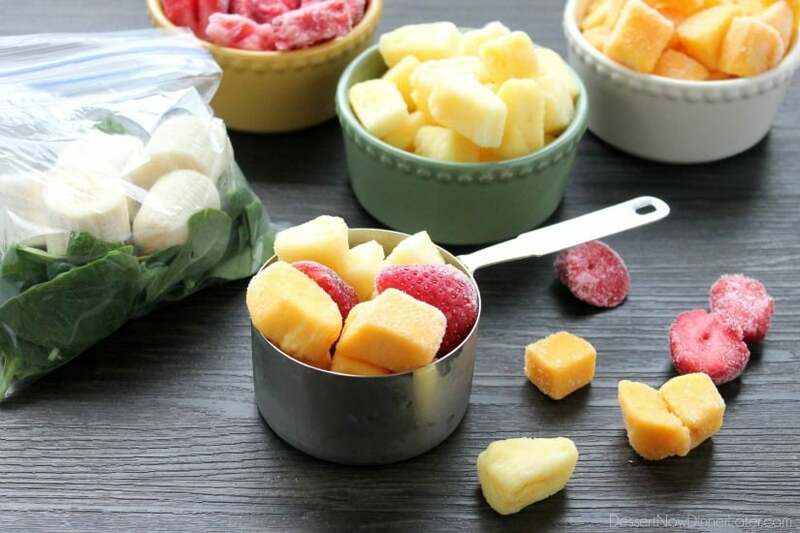 The smoothie freezer packs should last 2-3 months in the freezer. I would just make one smoothie at a time when you are ready to drink it instead of putting it in the refrigerator, but if that’s how you like your smoothies try it. It might be ok for a couple days. I love this idea and drink smoothies all the time but sometimes feel kinda lazy and don’t wanT to make it. Wish I’d thought of this! 😉 Thanks a heap! Does the yogurt lose the good bacteria when frozen? Just thought it might change the healthy bacteria. Trying to eat healthier and can’t wait to makes these. Thanks! I cannot stand bananas, have not been able to eat them since early childhood, so it is unlikely to change now. Can you suggest an alternative? You can simply leave them out or replace with another light colored fruit like peaches. 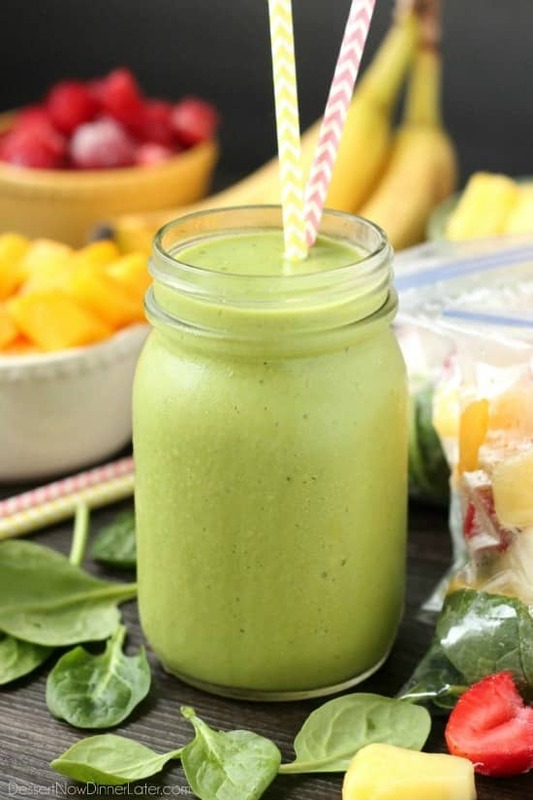 Avocado adds a smooth texture to blended drinks and can replace the banana – you will probably need to add some sweetener to make up for the sugars from the banana. How many calories are in each smoothie pack since the recipe makes two cups and do you drink it all at once or save a cup for later? It depends on the types of fruit and liquid that you add to it, but it starts at about 200 calories and goes up. I usually drink all of it at once. What a fantastic idea! I’m gonna trying this real soon. I’m thinking if I’d add some kind of nuts after frozen fruits blend. Also maybe to add a bit of ground chia seeds or flax. I do love adding chia and flax to my smoothies. Definitely customize it the way you want it! Enjoy! Hi Tina! If you want a more filling smoothie as a meal replacement, you can swap the Greek yogurt with a scoop of protein powder. This is my favorite on Amazon: http://amzn.to/2pV6chA (affiliate link). You wouldn’t freeze it with the fruit though. When you go to make the smoothie pour the milk in your blender, then the scoop of protein powder, then the frozen smoothie pack so everything blends better. You can also add 2 Tablespoons of flaxseed meal or 1 Tbsp chia seeds for extra health benefits (Omega-3 fatty acids) when you add the protein powder. Other than that, I don’t have a lot of healthy meals, but you can find what I do have here: https://www.dessertnowdinnerlater.com/tag/healthy/ Good luck! Hey! Fantastic idea! I tried this this week and had one issue.. my bags were frozen into one large conjoined ball, making it hard to fit in my ninja blender. Any suggestions?? 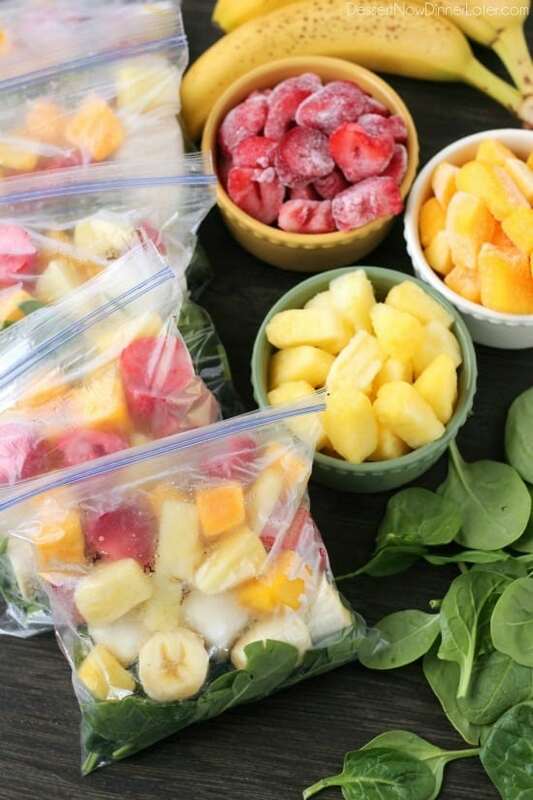 Did the frozen fruit thaw too much while you were assembling the bags? That may have caused it to freeze together in one clump. You can try banging the bags on the side of the counter the break it up before you add it to your blender. Trish, try flash freezing your individual items then put them into your freezer bag. This way your items are individual and loose and not one large ice cube. I tried to make a smoothie with kale this morning, but ended up with kale chunks. Does yours usually blend all the way down? Any tips on getting rid of the chunks from the kale? 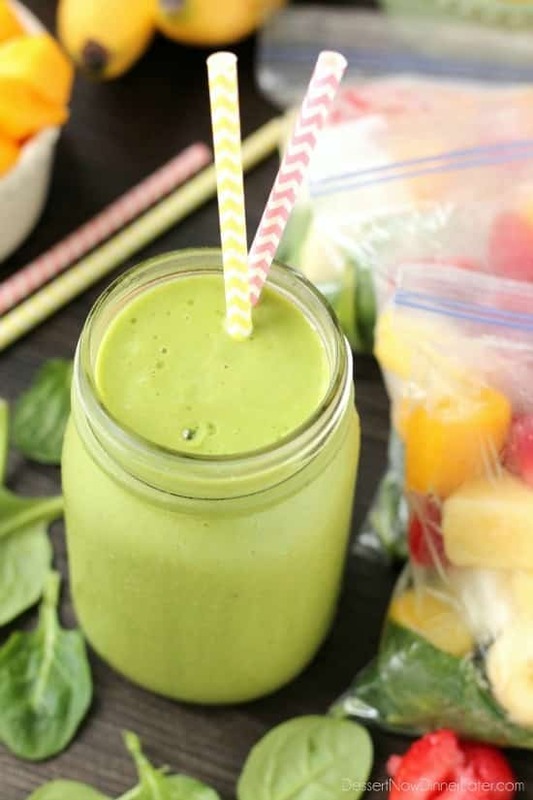 I haven’t tried kale in my smoothies, but I’m betting if you don’t have a high efficiency blender like a Blendtec or Vitamix, it may be tricky. Maybe blend the kale first with the liquid all by itself, then add the fruit & yogurt. Good luck! What can be a substitute if you don’t like banana? You can just leave it out or substitute another fruit it its place. Hi I love this idea! Can you tell me how long can the frozen packs last in the freezer? Is two weeks ok? They would definitely be ok for 2 weeks. They can last about 2-3 months. What are your thoughts of freezing your powder supplements in water (big ice tray) to include in the bag as well? I haven’t tried it myself, so I can’t say how well it would work. I just add the powder to the pack as I’m making it into a smoothie. Wow this was an awesome smoothie. I added flax seeds and 1 packet sweetener it turned out delicious. Love the idea that in the morning just add almond milk and pour in bag and it is ready. Thanks. I’m glad you are enjoying this recipe Joyce! This is a great idea and time saver! However, my bananas turn brown when i put them in the freezer. Are they still ok to eat or am I doing something wrong? Thank you! If you leave bananas in the peel, the peel will turn black. If you peel them, they will eventually brown depending on how long you keep them in the freezer, but mine stay nice for a month or two in a plain zip-top bag. I still use them even when they are brown though. Try to squeeze out as much air as possible. That’s what’s causing the oxidation/browning. 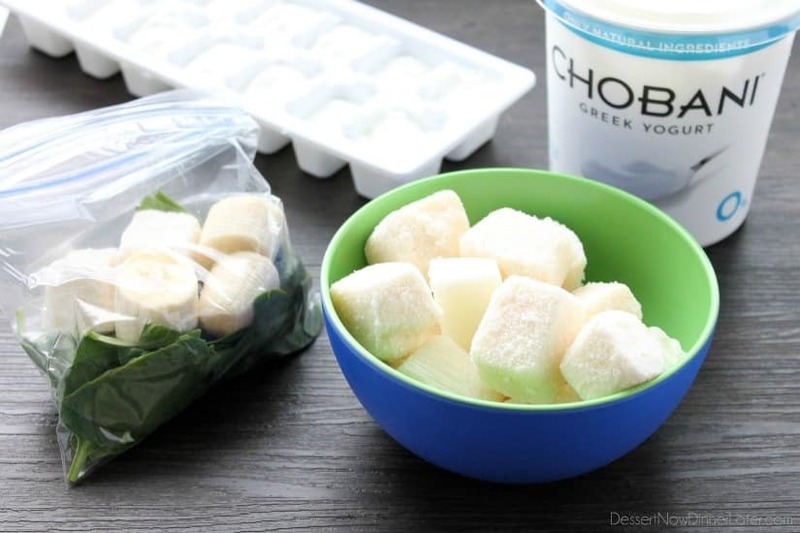 I’ve often frozen the fruit in packets, but never thought about doing the spinach and yogurt too. Fantastic idea! I usually use green tea instead of water, almond milk, etc. Lots of good things in green tea and super mild so it won’t mess with the other flavors. This is such an awesome idea! Now I do not have an excuse for making a smoothie. Do you have an idea of how many ice cubes of yogurt equal a cup? Also, do you recommended adding chia seeds to the baggies or in the blender? My ice cube tray is about 2-3 Tbsp per ice cube. You can test yours with a measuring spoon and water. You should also be able to freeze the chia seeds with the other ingredients, no problem.